^ a b BirdLife International 2009. Ara macao. In: IUCN 2011. IUCN Red List of Threatened Species. Version 2011.1. <www.iucnredlist.org>. Downloaded on 20 June 2011. ^ a b Juniper, T. and M. Parr. 1998. Parrots: A Guide to Parrots of the World. Yale University Press. ^ a b c Marineros, L., and Vaughan, C., 1995. Scarlet Macaws of Carara. In: Abramson, J., Speer, B., Thomsen, J. (Eds. 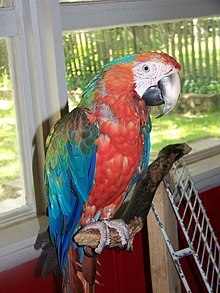 ), The Large Macaws: Their Care Breeding and Conservation. Raintree Publications, Fort Bragg, California, pp. 445-467.